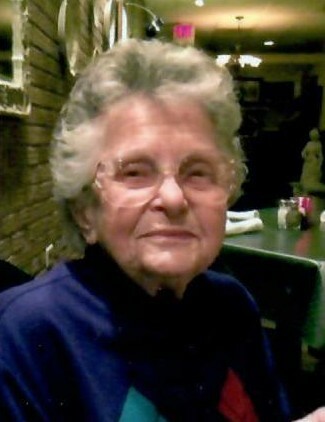 Lena M. (Bach) Glynn, 92, of La Salle, passed away in her home surrounded by her family on April 2, 2019. Mass of Christian burial will be 11:00 AM Friday in St. Hyacinth’s Church in La Salle with the Very Rev. Paul Carlson officiating. Entombment will be in Forest Lawn Memorial Gardens. Visitation will be in the church on Friday from 9:30 AM until time of services. The Hurst Funeral Home in La Salle is assisting the family with arrangements. Lena was born on November 26, 1926 to Joseph and Dominica (Talliani) Bach, one of eleven children. She married Thomas Glynn. Together, they built the La Salle Speedway and ran Tommy’s Auto Salavage for 50 years. She worked at Westclox and St. Margaret’s Hospital until she retired. Mrs. Glynn loved her family, playing cards, reading, and teaching her great grandchildren to bake and roll cookie dough. She was active in her church, enjoyed cutting the grass and having lunch once a month with her sisters and family. She lived one day at a time making the most of every moment. She believed in laughter and kindness. Mrs. Glynn is survived by two sons Ronald (Bonnie) Glynn of La Salle and John Glynn of Peru; daughter-in-law Darlene Glynn of Peru; daughter Rebecca (Jim) Hughett of La Salle; stepson Denny (Barbie) Glynn of Peru; five sisters Betty Stockdell, Jean Just, and Eleanor Wozniak all of Peru, Marie Harrison of Bureau, and Nancy (Don) Johnson of Ottawa; two brothers David Bach of South Carolina and Paul (Debbie) Bach of Dixon; sixteen grandchildren; thirty-six great grandchildren; and seven great-great grandchildren. She was preceded in death by her husband Thomas, one son Raymond Allan “Benny” Glynn, one great granddaughter Jenny Glynn, one brother Raymond Bach, two sisters Caroline Farrell and Julie Chorzempa. Pallbearers will be Mark, Steven, Joe, Ron, and Tom Glynn and Doug Hughett.